This is a carefulley etched portrait of the Full rigged ship Charles E. Moody. The etching is on a curved chunk of beach-washed Fossil Walrus with light sand color. 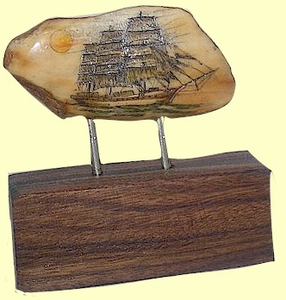 The piece is set on a substantial piece of well-striated Bolivian Rosewood with German Silver pins. The etching is done in light color. The Charles E. Moody, a down easter, was Built by Gass and Sawyer at Bath, Maine in 1882. She burned at Naknek, Alaska June 28, 1920. She belonged to the Northwestern Fisheries Co., and made one passage of 1,350 miles from Puget Sound to Orca, Alaska in 10 days, in 1911. Capt. Peter Bergman commanded the ship on the voyage north. The ivory measures 3 inches from side-to-side and 1 3/8 inches high. The display piece stands 3 1/2 inches high with the base. This is a beautiful display piece any collector would be proud to have. Signed by Marvin M. Cohen.